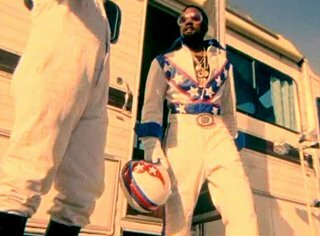 According to Allhiphop , Legendary daredevil motorcycle stuntman Robert Craig "Evel" Knievel has filed a multi-million dollar lawsuit against Kanye West, claiming the Chicago rapper tarnished his image in the video for the hit single "Touch The Sky." "In my opinion, this video maybe reflects West and his way of life, but it's sure not mine," Knievel told the St. Petersburg Times. "I don't want my children or my grandchildren associated with this kind of thing...I want it stopped." Evel Knievel doesn't like black people. get over yourself, crusty cracka! "I don't want my children or my grandchildren associated with this kind of thing...I want it stopped." What kind of thing, rap music?? Mister Evil Knievel just played himself with that statement right there.